FRANKFURT -- Thyssenkrupp will split into two companies, one focused on capital goods and the other on materials, giving in to years of investor pressure and undergoing its biggest overhaul since the merger of Thyssen and Krupp 20 years ago. The group said on Thursday it would spin off its elevators, car parts and plant engineering businesses to shareholders, with Thyssenkrupp Materials, the company that will hold the remaining assets, initially retaining a minority stake. "We are planning the creation of two independent companies with a common DNA and strong roots in a joint history spanning more than 200 years," CEO Guido Kerkhoff said in a statement. "Now we are proposing a solution that not only creates value for our shareholders but also significantly improves the prospects for our businesses." The plans are a major victory for activist shareholders Cevian and Elliott, which have demanded changes to improve the group's operational performance, pointing to its overly complex conglomerate structure. They are also a bold step by Kerkhoff, who was recently brought in as a stopgap manager amid turmoil on the executive board. He said his current management team was fully capable of implementing the proposed split into two companies. Thyssenkrupp's supervisory board is due to sign off on the plans at an extraordinary meeting on Sunday, Sept. 30, which also marks the end of the company's financial year. Shares in Thyssenkrupp rose as much as 17 percent after the official announcement, which came after Reuters reported exclusively that the group was considering the separation of major business divisions. "While there is a long road ahead and execution risk remains, we believe this would be a key positive catalyst for TKA (Thyssenkrupp) driving a significant re-rating towards cap goods peers," Jefferies analyst Seth Rosenfeld wrote. Thyssenkrupp's strategy shift comes as rival conglomerates including Siemens and General Electric are slimming down. The group has been in crisis since the sudden departure of both its chief executive and chairman in July, under pressure from shareholders dissatisfied over a lack of action and concerned that a steel joint venture with Tata Steel did not go far enough in simplifying the business. Cevian, Thyssenkrupp's second largest shareholder with an 18 percent stake and holder of a seat on the group's 20-member supervisory board, said it fully supported the restructuring. "This will reduce complexity, promote entrepreneurial freedom and agility, and enhance the ability of the ThyssenKrupp's businesses to realize their potential," its co-founder Lars Foerberg said in a statement. Thyssenkrupp has in the past said it wanted to focus on strengthening its capital goods business, which will now be renamed Thyssenkrupp Industrials, and last year raised about 1.4 billion euros ($1.64 billion) to do that. 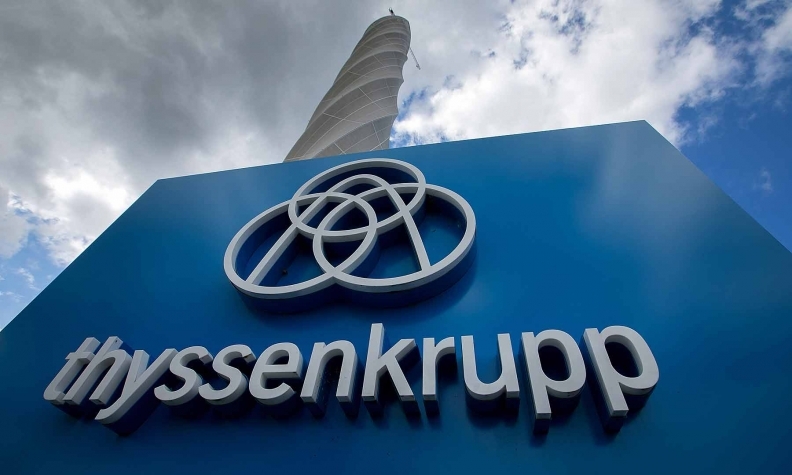 Shareholders in Thyssenkrupp will continue to hold all of Thyssenkrupp Materials, which will comprise materials services, a 50 percent stake in the joint venture with Tata Steel, slewing bearings and forging businesses and a marine business. Both Thyssenkrupp Materials and Thyssenkrupp Industrials will be listed, and liabilities and pension obligations are to be allocated between the two, Thyssenkrupp said. The Alfried Krupp von Bohlen and Halbach Foundation, Thyssenkrupp's largest investor with a 21 percent stake, said it would not oppose a solution that secured competitiveness and jobs. The group's powerful labour representatives, which control half of the supervisory board's seats, also backed the plans. "This step prevents a break-up of Thyssenkrupp. A sell-off of business will not happen," said Markus Grolms, interim supervisory board chairman and secretary at IG Metall, Germany's biggest labor union.